"Fat People Don't Go to Heaven!" screamed a headline in the tabloid Globe in November 2000. The story recounted the success of the Weigh Down Workshop, the nation's largest Christian diet corporation and the subject of extensive press coverage from Larry King Live to the New Yorker. In the United States today, hundreds of thousands of people are making diet a religious duty by enrolling in Christian diet programs and reading Christian diet literature like What Would Jesus Eat? and Fit for God. 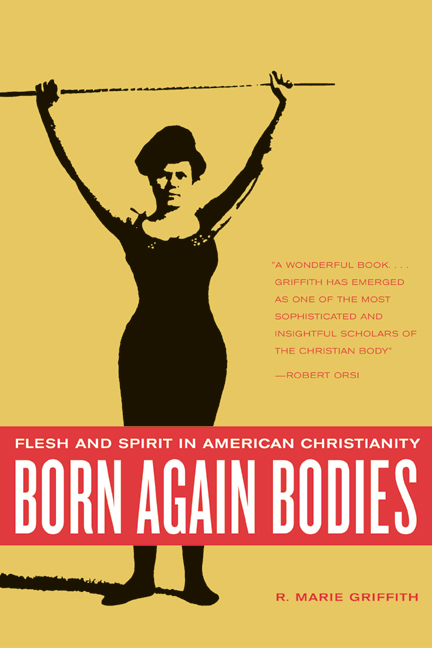 Written with style and wit, far ranging in its implications, and rich with the stories of real people, Born Again Bodies launches a provocative yet sensitive investigation into Christian fitness and diet culture. Looking closely at both the religious roots of this movement and its present-day incarnations, R. Marie Griffith vividly analyzes Christianity's intricate role in America's obsession with the body, diet, and fitness. As she traces the underpinning of modern-day beauty and slimness ideals—as well as the bigotry against people who are overweight—Griffith links seemingly disparate groups in American history including seventeenth-century New England Puritans, Progressive Era New Thought adherents, and late-twentieth-century evangelical diet preachers. R. Marie Griffith is Associate Professor of Religion at Princeton University and author of God's Daughters: Evangelical Women and the Power of Submission (California, 1997). “Nothing but a Dense Shadow”: The Body as Delusion?